The Internet has gone Local. What does this mean for Personal Trainers? An effective keyword-targeted web site can deliver dozens of new clients to your door. See how simple it is below. Does it Pass the Traffic Test? How did you find this web site? Chances are you were searching for something using a search engine. That's how thousands of people find me every month. Face it, search engines have become the way people research and shop for just about everything. Isn't my Business too Local for the Internet? There is very little competition for these local searches. 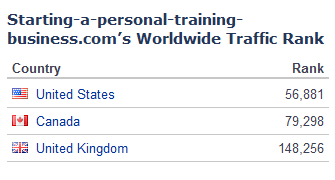 Sarah has listed herself on some trainer directories that don't get much traffic. Maybe she put up a craigs list ad that gets buried quickly. Now this is a decent start. But Sarah really needs more than a quick online profile or a classified ad. She needs a full web site to inform the consumer. Personal Trainer web sites can convey your training philosophy, your education and certification history, your pricing programs and promotions, along with showing your picture and contact information. That is much more information that a yellow page listing or even what our free directory offers. Don't make people pick up the phone and contact you for basic information. Good personal trainer web sites give people all the information they need. If Sarah creates a web site about personal training in Bradford Pennsylvania, she will go to the top of the search results because there is nobody else with personal trainer web sites for that area. See how you can get the top search result for your local business. OK, so you know you need a good web site. Now you need to be aware of some of the traps. There is no shortage of companies that promise you a web site for something ridiculous like $9 per month. Its becoming more common for the certification providers to offer these deals. How can they offer this? Don't get stuck with a web site consisting of a few poorly designed and poorly optimized web pages. The end result is that the search engines will hate your site and not send you any traffic. So even though you paid only $9, you got no value from the experience. Most personal trainers do not have their own web site. Most of the personal trainer web sites are poorly optimized and produce no results. That translates into a huge opportunity to capture this market of web searchers where very few are doing it. First off...I hope you like my site. Would you believe that in less than 2 months from the date I started this site, I was already in the top 1% of all web sites for number of visitors according to Alexa. The image to the right shows my traffic ranking out of over 56 million web sites on the Internet. Incredible results based on smart tools helping me to write pages that both people and search engines like. Have you noticed that I have used the phrase "personal trainer web sites" a few times on this page. That is no accident. Optimizing this page for that phrase helps me move to the top search engines results for this popular search term. How Did I Know How to Do This? After doing a whole lot of research before starting this site, I went with SBI as my web site provider. Simply put, they had the best set of tools for the best price. I built this web site with SBI and I pay only $25/month with no setup fees. Yes, I get a web site in the top 1% of the entire Internet for $25 per month. There is no excuse for not building personal trainer web sites (there's that phrase again). The first client you get through your web site will pay for the entire year. I am a personal trainer, not a computer expert and I was still able to make a great web site with my own domain name and unlimited email addresses. SBI takes the hassle out of technology and makes it easy for us non-techie people. But I can't begin to explain the benefits. Invest 15 minutes in finding out how easy it is to have a big local presence for your personal training business on the Internet. And if you have questions, you can talk to a real SBI customer on the phone or ask an email question here.